15 of us gathered at the Hempstead Road car park for a walk led by Dave Horsley, who has been familiar with Holt Lowes for many years. At 10am, the weather was fairly bright, despite the fact that we had chosen St Swithin's Day for the outing. 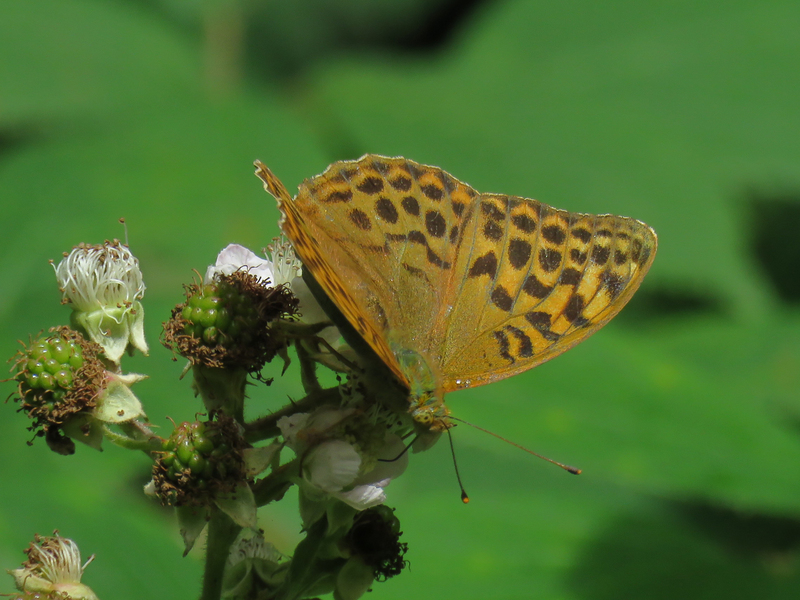 Butterflies were active around the car park, Gatekeepers and a Red Admiral, and as we walked towards the heath, we found a Silver-washed Fritillary and a Comma. 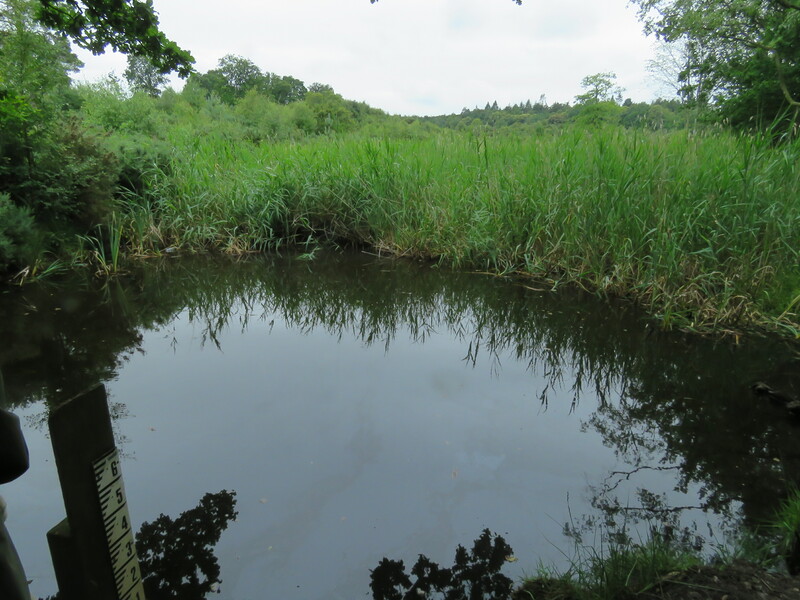 When we arrived at the gate to the heath, Dave Horsley explained what made the heath so special (it's an SSSI); on top the soil is sand and gravel (acidic ), but the underlying layer is chalk (alkaline );the heath is bounded at the bottom by the River Glaven, one of Norfolk's chalk rivers. 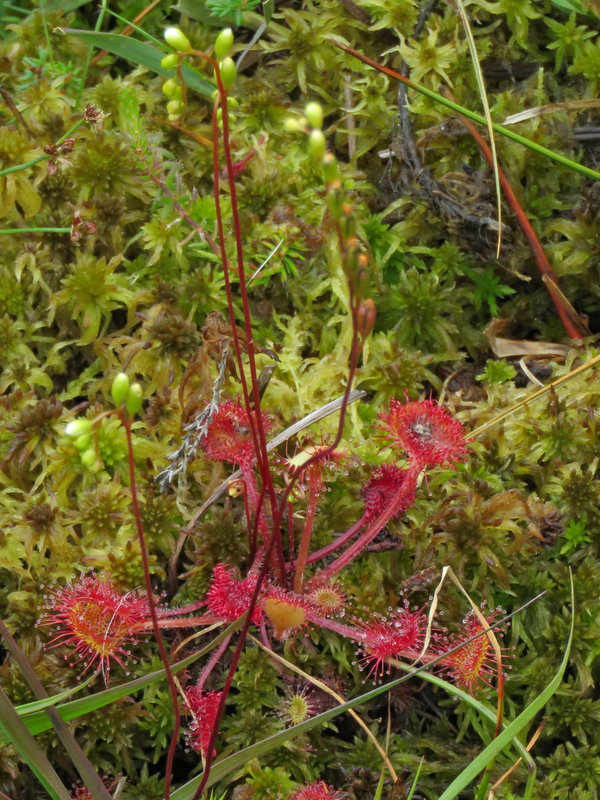 This gives a rare combination of plants, both acid-loving and alkali-loving. 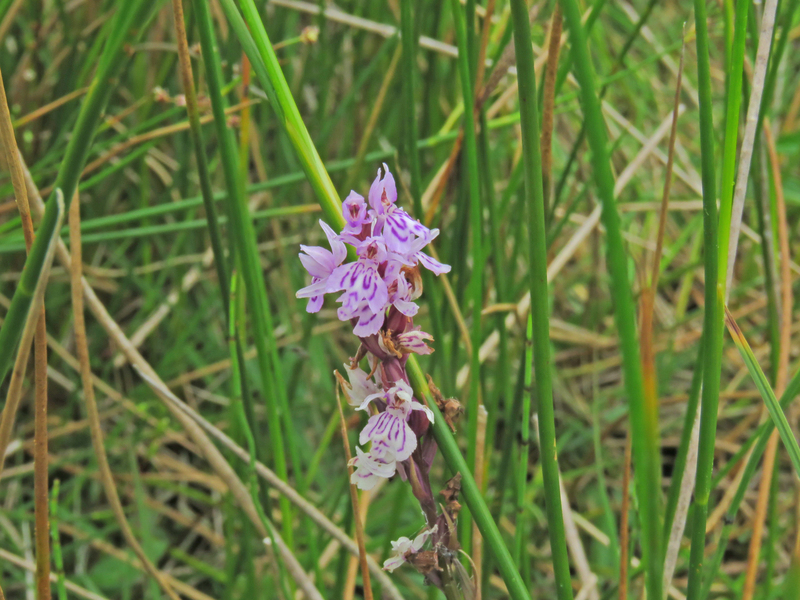 The site is managed by Norfolk Wildlife Trust for the trustees of Holt Lowes. A large area was scraped down to the sand and gravel in 2009 and is currently in the process of regeneration; but as well as the heather and gorse, large numbers of Silver Birch and Corsican Pine trees are also regrowing. It is possible to see the limit of the scraped area in the picture above. 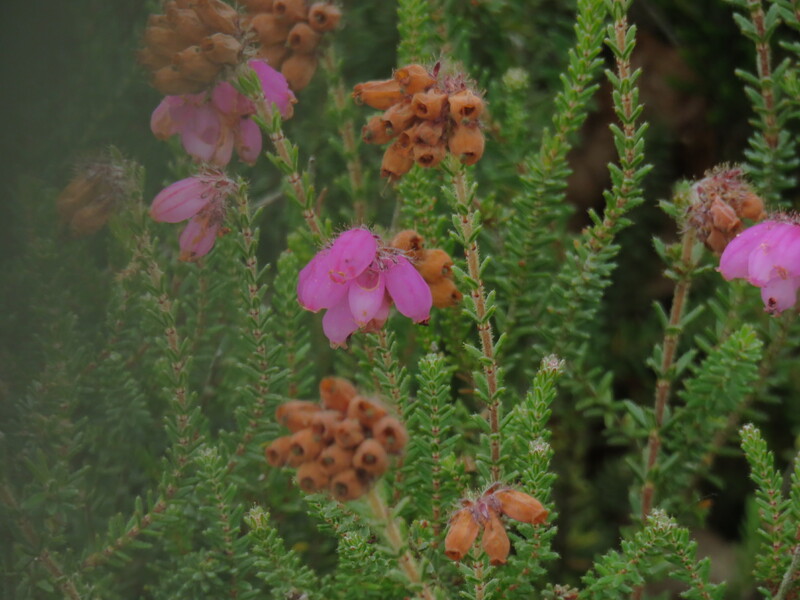 There are two species of gorse on the heath - European("a thug") and Western, and three species of heather - Bell Heather, Ling and Cross-leaved Heath. 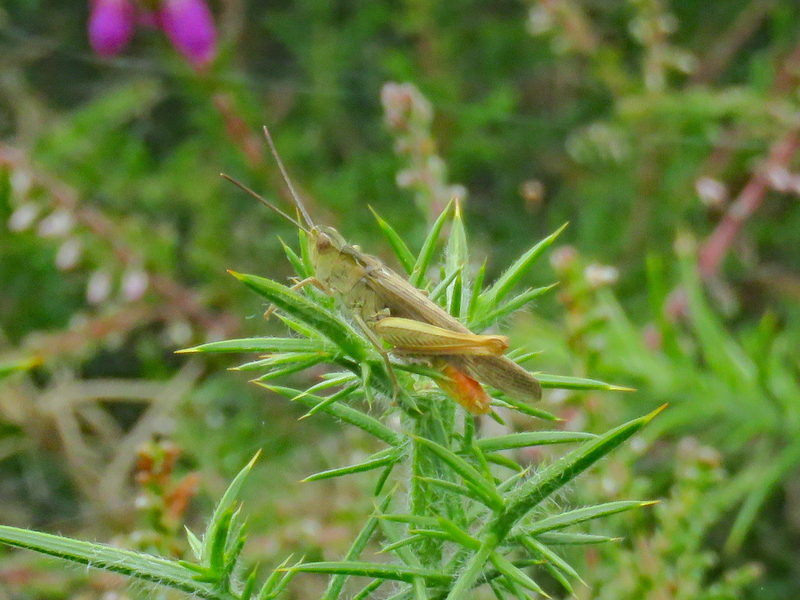 We spent some time examining the grashoppers, and found three species (common, mottled and stripe-winged), plus a specimen of one of Holt Lowes rarities, a (small) bog bush cricket. 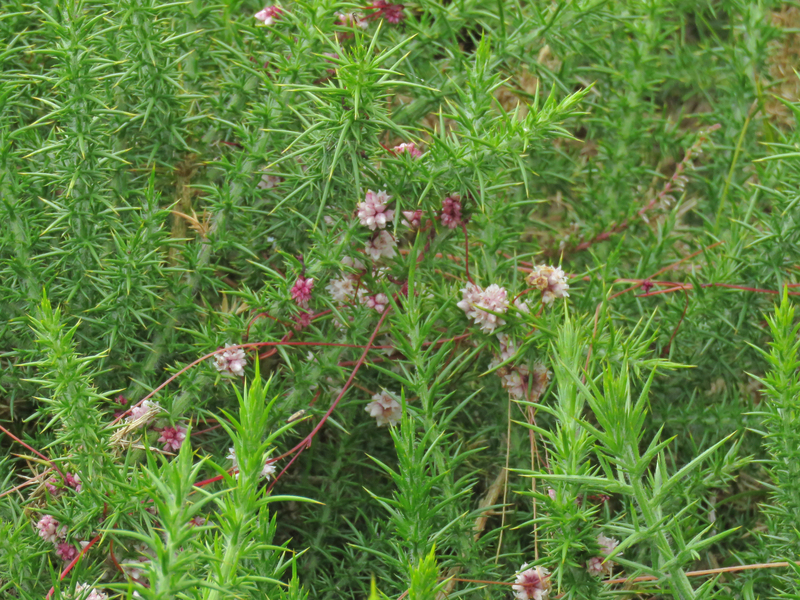 While watching grasshoppers, we found a patch of dodder in flower; dodder is a parasitic plant, in this case living on gorse. As we approached the smaller of the two valleys which cut through the heath, it started to rain lightly; after last July's outing to Upton Fen, it was perhaps tempting fate to choose St Swithin's Day for this trip, but fortunately the rain remained lght and did not persist for more than ten minutes. Here we learned about the remarkable nature of the Lowes; at the top of the valley bank, the ph level has been measured at 6.8 and at the bottom, at 3.2; ph is measured on a logarithmic scale, so that's a huge difference within about ten metres. 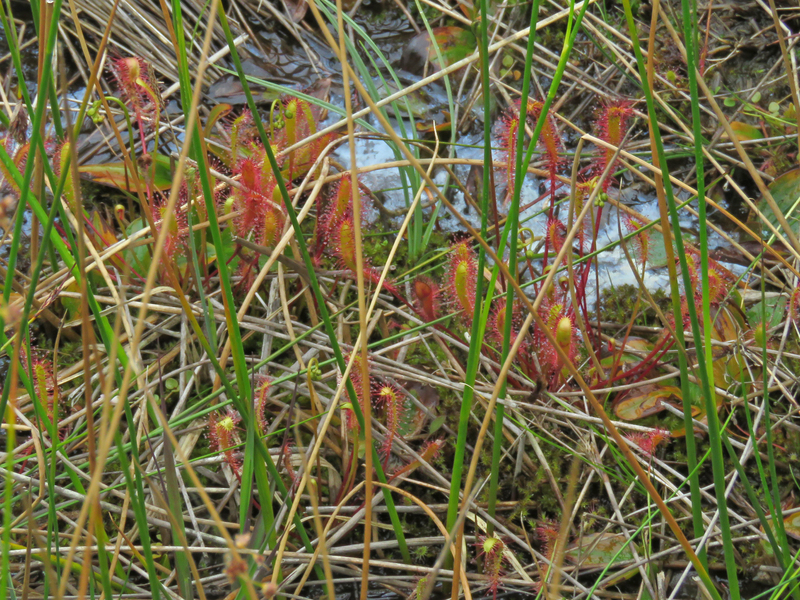 Dave showed us two different, but related, sedges; one acid-loving and one alkali-loving growing within 5 metres of each other. 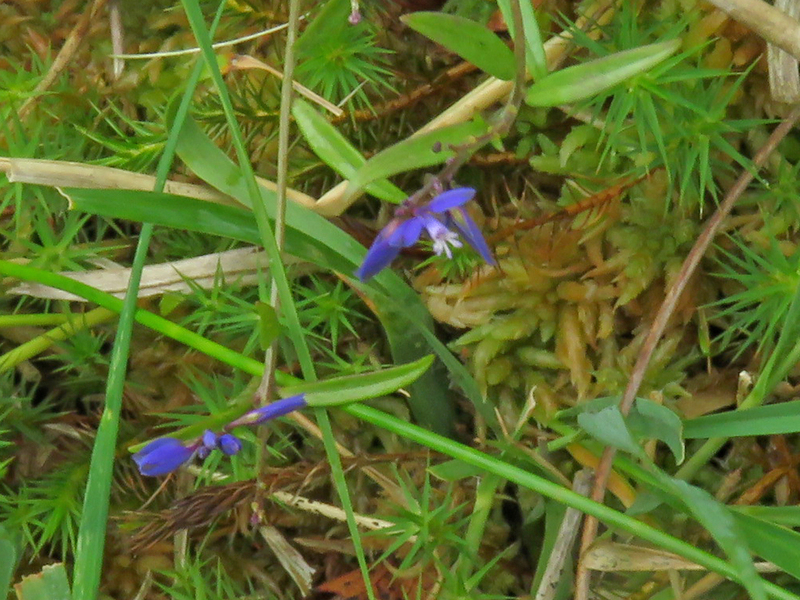 The bottom of the valley is described as mixed mere, neither fen nor bog; down here we found milkwort, both blue and pink forms, St John's Wort and Sundew. Both Round-leaved and Long-leaved varieties were present and there was much discussion (inconclusive ) as to whether some were of the Intermediate form. We climbed the bank on the far side of the valley and followed it downstream, crossing it again at Soldiers' Pond, created by soldiers based here during the first world war by damming the stream. 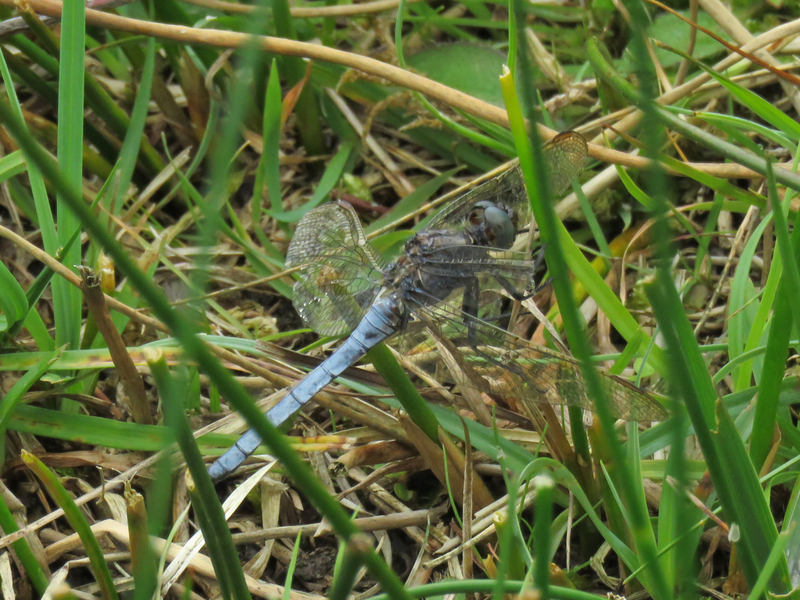 The pond is in danger of being overgrown by phragmites, though there has obviously been some clearance work done. 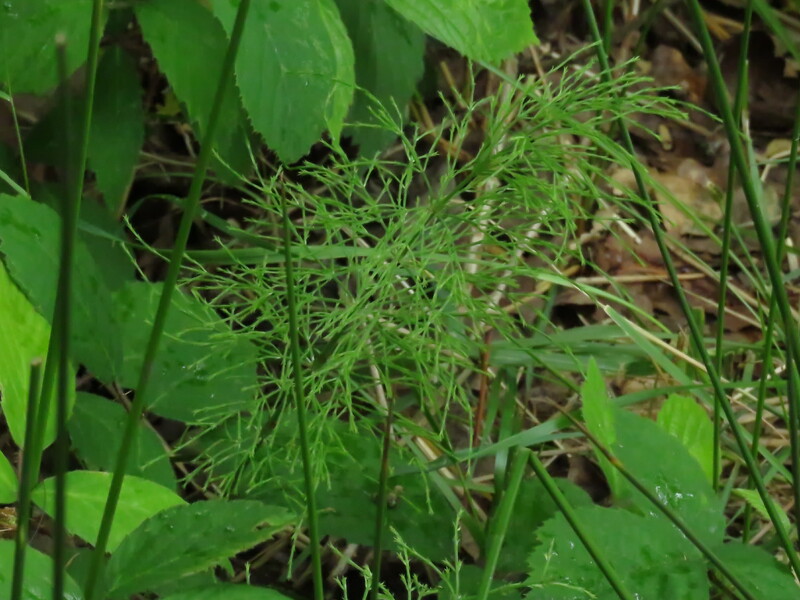 Here Dave showed us Wood Horsetail, another of the site's rarities, although he told us that it is less abundant than it has been. As we turned back towards the car park, Dave Horsley pointed out the meadow down by the Glaven, which should have lots of orchids, but seems to have very few, possibly as a result of grazing by the Dartmoor ponies; he suggested that some areas should be fenced to exclude grazing for at least some of the year. We found surprisingly few birds on the heath - a few groups of linnets, a single kestrel, and a very vocal, but invisible, yellowhammer. 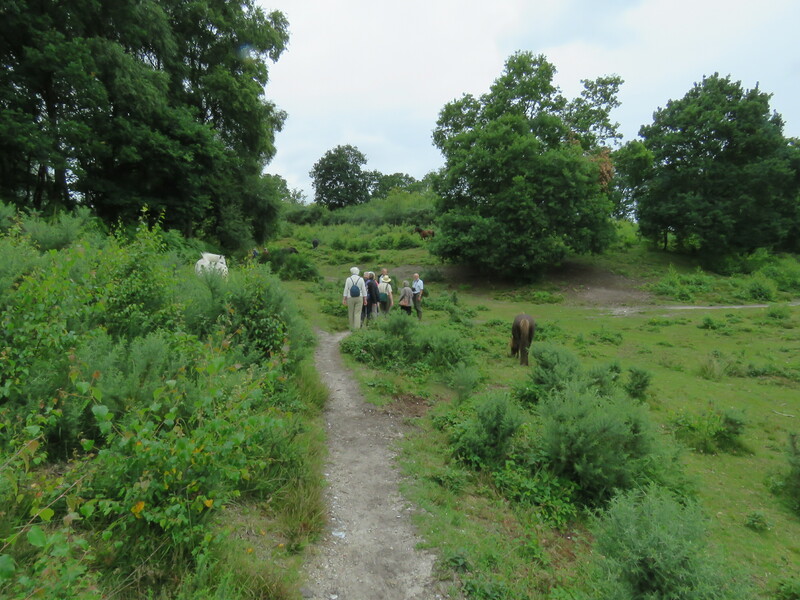 Our thanks to Dave Horsley for a great introduction to Holt Lowes; several of the group were heard talking afterwards about returning to explore further by themselves.